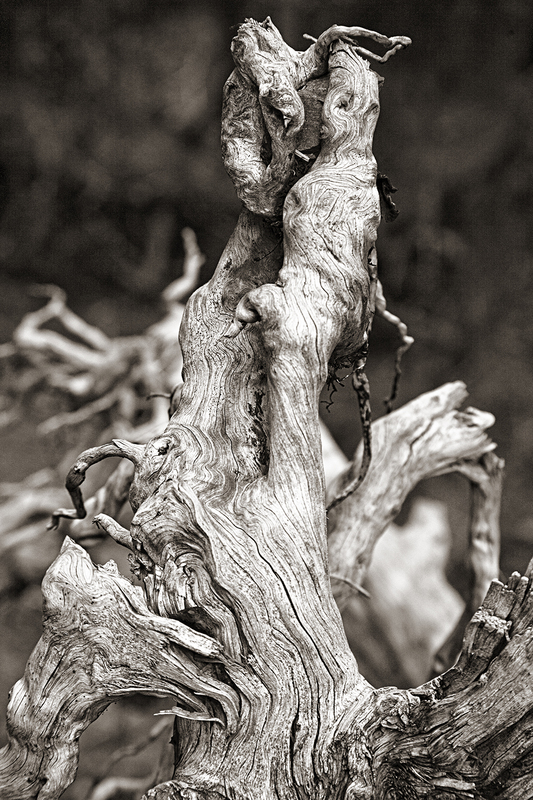 This is a detail of a gnarly pine atop 12,100 foot Frazer Mountain just north of Taos Ski Valley. Frazer Mountain is the crest of Northside at Taos Ski Valley, the Pattison family’s 1,200-acre aerie in the Sangre de Cristo Mountain that rise above the town. The photograph reveals shimmering highlights that are reminiscent of a real silver gelatin print. That silveriness is something that digital prints often lack. The soft focus background or bokeh lends something ethereal and seems to bring the pine forward in the frame. Bokeh comes from the Japanese word “boke” and both are pronounced “boke eh”. Fittingly enough the word means blur or haze. Quiz later. Wow, what an impressive image. Yep, it looks like it just came out of the darkroom bath. Makes me feel like I'm standing right in front of this ancient piece of tree. Lovely. Thanks Terry. It really does feel like a darkroom print. My guess is that it's due to the light that particular day. If I could replicate it I would. I think it's a Bristlecone. It is a very gelatin silver image, with all the shades and textures that makes film special. Well done, Steve. Hope that is part of your upcoming show! It is Bristlecone and you captured it beautifully.